From Sept 6-10, 2011, I was able to get away for a 1300 mile round trip blitzkrieg fishing adventure. 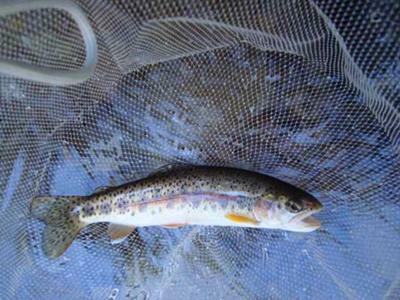 It also enabled me to catch, photograph and release 3 of the 6 California native trout needed for my California Heritage Trout Challenge certificate. My daughter and a friend, who is a new Tenkara convert, were supposed to go with me, but both cancelled at the last moment. Needless to say, that did not stop me in the least. See ya!! From my home in the SF Bay area, I headed NE to the Mt. Shasta/McCloud River area. Settled in at a USFS campground that has a small tributary stream running through it. 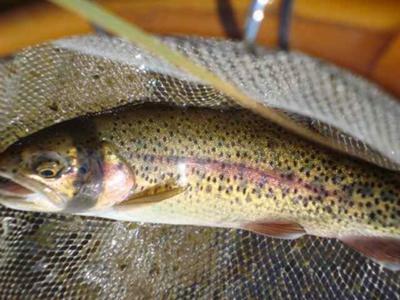 This creek and several other small creeks in the area are pretty much the last refuges of the native McCloud Redband trout, being driven from the main McCloud River through the years with plants of rainbow and other species of trout. The afternoon and evening was spent catching the beautiful little native trout on dry flies. The average stream width was less than a rod length, the average depth 4-6". The deeper water pockets throughout the course of the stream provided all the opportunities needed. You just had to get to them. Tree covered, but a higher canopy allowed a little more casting room. I knew I would need a short line, so I rigged up with a 9'-6" flouro tapered line of my own design, 3' of 5x, dry CDC caddis, 12' Iwana. Turned out to be the only setup I used for 4 days, with 1 strange exception. (More on that in another post). Short, precise casting to pockets and runs sometimes less than a rod length away, most a little farther. And don't think that just because they came up for your fly that you're going to catch them!!! Quick little buggers!! The afternoon provided 10-12 little native Redbands, photographed and released. Back to camp for dinner and bed. I had a long drive the next day. Wednesday was a long travel day, about 250 miles, taking me to a part of California I have never been to before. 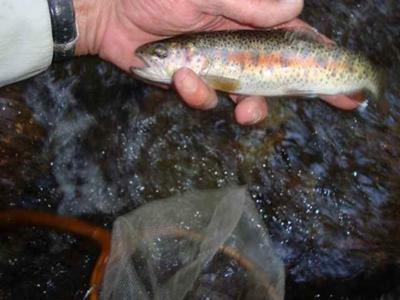 Another mountain chain and its streams, and two more Redband trout species. Settled in at a beautiful Oregon state park, right on the border of California and Oregon. The Warner Mountains were to the east and south of me. I needed to fish both sides, each for their respective species. Thursday AM, I left the state park and drove about 10 miles up into the foothills of the Warner Mountains, alongside a small western side trib. Good gravel USFS road leading up the mountains and lakes/campgrounds. I needed to hit the tribs. Found some parking and scrambled down to a creek smaller than yesterday. HA! A little more average depth, but not much. A little steeper gradient as well, providing more plunge pools and short little runs. PERFECT. Wet wading like the day before enabled me to avoid most of the trees/bushes, but if I said I didn't get hung up or lose a few flies, I'd be lying. Several 6"-8" natives fell to my dries. Photographed, admired and put back. Drove downstream and tried two other spots I had seen on the way in. Two brown trout. Not too good a sign. I then left late morning to head south along the western side to get to another trib and a USFS campground where I wanted to stay. On the way I got a flat tire. Not good!!! 15 miles from any civilization, on a forest dirt road. I changed the flat and immediately decided to make the 40 mile one-way drive to the nearest town to get my tire fixed. I wouldn't even THINK of driving another 50 miles of forest roads without a spare tire. Made the hour long drive to town. They looked at my tires and strongly suggested I get some new tires. Seems they were a little overdue for replacement. An hour and a half and $500 later, I'm driving back up into the mountains. I got things to do!!! Late afternoon gets me to the USFS campground with the trib running through it. Meadow stream. Set up camp first, always a smart thing to do, then try the meadow stream. One or two splashy rises at the only structure in the meadow portion. I decided to take the adjacent forest road upstream a mile or two since the map showed it going uphill, although not at a steep rate, but enough it turns out to provide many chances for other trout. A short scramble down the banks and along the stream presented many opportunities. Rod length wide, 12" deep, deeper pockets. Dry fly heaven. Willing, beautiful native trout. A short, intense thundershower moves in on me about 6 PM, ending my fishing day. Drive back to camp. GOOD THING I HAD CAMP SET UP ALREADY!! It's my number one rule on any camping/fishing trip. Today gave me my second Redband trout from two different streams on the west side. Perfect. Made dinner and relaxed. Went to bed on the early side. Lotta driving to do the next to get my third Redband. Up with the rising sun, had breakfast, packed and left. I headed north on forest roads to a main forest road that bisects the mountain east-west, saving me 100 mile trip back out of the mountains and around on paved roads. I have new tires, don't I? The east-west road proves to be a 40 mph gravel forest highway. Excellent views at the top, also a major crossing point for the 1800's wagon trains coming into California. Down to the east side of the Warners and headed north to the last mountain of the chain, Mt. Bidwell. I needed to get to the little stream on its north flank. Left the pavement and took a decent quality forest road up the western flank of Mt. Bidwell. Up it goes from 4500' to 8500' elevation. I got to the top of the saddle and saw the sign to my destination. Took a right and drove about two miles to this HUGE high mountain meadow with a swamp at its higher southern end, up against the backside of Mt. Bidwell. On the drive into the meadow, I saw many rivulets of water draining the meadow, mostly heading north. This swamp and its many rivulets are the headwaters of my creek, less than a mile away. NOW I HAD TO FIND THE CREEK. High meadow grasses everywhere. Little braids of water. I drove another mile to the bottom of the meadow. I was told by someone to look for the road culvert. THAT IS THE CREEK!!. Luckily I saw and heard running water on the road, but no culvert. I parked and walked back a ways. HA! There it is!! Shrubs had grown over the ends of the culvert on both sides of the road, hiding it. I looked over the bushes on the downstream side and saw a little pool, 24"x24" with the little creek running out of it. I went to the upstream side and saw a creek 8"-12" wide and 4" deep, winding thru the high meadow grass, coming into the culvert. YOU'VE GOT TO BE KIDDING ME!!!! 20-30 MPH winds, blowing upstream. GREAT!! I decided to walk up a short ways and check. EXTREMELY SMALL POOLS AND RUNS. EXTREMELY NARROW!! WHAT'S A POOR GUY TO DO? Early afternoon. Walked back to truck and geared up. Back to the bottom culvert pool first. Got lucky cast and drift with dry through the pool. MISSED HIM! He wouldn't come up again. Headed to creek above culvert. Leaned too far over the edge of the creek and scattered a few small trout. Gotta be a lot more careful. Up a short ways and spot a small run, about 2' long with good depth. Take a deep breath, Joe. You're probably only going to get one chance here. Waited for the wind to die down a bit, made one cast and hit the head of the run. Lifted rod and followed down gently. THERE HE IS!!! HE TOOK THAT SOLIDLY!! He tried to run away, but there ain't nowhere to go!!!!! Netted him, removed hook and took several pix of the ONLY Warner Lake Redband I was to hook and land that afternoon!!! My third Redband!! From a creek as wide as my cork handle is long!!!! With no luck the rest of the afternoon, I decided to make a long ride halfway home that night to another campground, going home the following day. In all, it was a truly rewarding experience. Beautiful country, georgeous trout, and a chance to fill in my HTC requirements. Great story. Well written. I felt like I was there with you. Thanks. Very nice story. I have hunted in the area 55 years. Leaving the little town of New Pine Creek off 395 you can continue up mountain road past Lily Lake, turn toward Dismal Swamp and the Oregon border. Right after passing into Oregon you will see a turn off to the right that takes you to the back side of Mt Bidwell. As you cross the creek you find some areas on the creek that are fishable. You must stay back from edge area and no shadows. I use very long noodle rod with some sucess. Return all fish please to water. Continue upward another 1/2 mile for great view of upper lake and Lake Anne.